National researchers are conducting a randomized control trial of Educare schools in Chicago, Milwaukee, Omaha (two schools) and Tulsa. The study was designed to examine the effects of a high-quality, birth-to-age-5, center-based early education program on children’s language, social-emotional skills and parent-child interactions. Researchers from FPG Child Development Institute at the University of North Carolina at Chapel Hill are leading the study and are partnering with researchers from University of Chicago, University of Oklahoma, University of Nebraska Medical Center and University of Wisconsin-Milwaukee. The study consists of a randomized sample of 239 children and researchers compared those children who attended Educare to those who did not. The study is tracking children through age 5 and researchers are continuing to analyze data to determine results as the children grow up. The first phase of study results were published in Child Development in 2017. 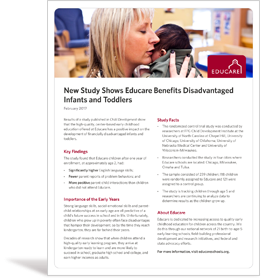 The findings show that the high-quality, center-based early childhood education offered at Educare has a positive impact on the development of financially disadvantaged infants and toddlers. More positive parent-child interactions than children who did not attend Educare. Strong language skills, social-emotional skills and parent-child relationships at an early age are all predictive of a child’s future success in school and in life. Unfortunately, children who grow up in poverty often face disadvantages that hamper their development, so by the time they reach kindergarten, they are far behind their peers. Decades of research show that when children attend a high-quality early learning program, they arrive at kindergarten ready to learn and are more likely to succeed in school, graduate high school and college, and earn higher incomes as adults. To learn more about the Educare Randomized Control Trial, please read our National Research Agenda for Early Education.